Since joining High Class Realty, Gennadiy has prided himself in his passionate and heartfelt drive to serve his clients' best interests. 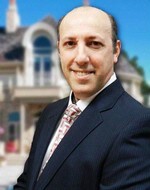 He is dedicated, knowledgeable, and committed to finding the perfect fit, whether apartment or home, for his clientele. His devotion and unparalleled customer service has resulted in a continuously expanding network of loyal clients and referrals. Passionate to his craft, he continuously seeks to stay ahead of the game when it comes to market education and trends.